This was the weekend that changed everything in Hong Kong. 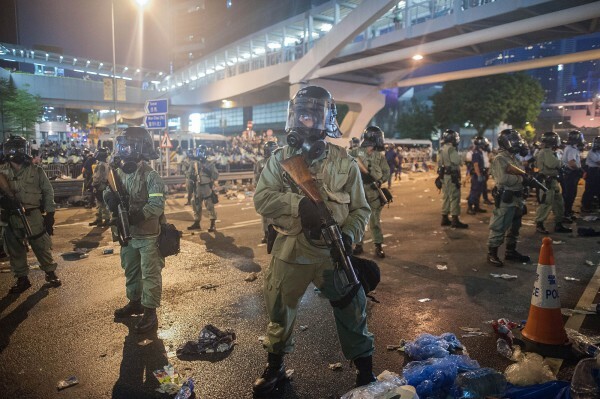 Mass popular resistance on the streets, by night and day, with mass gatherings of 100,000 and up to 180,000, spearheaded by the youth and a weeklong student strike, has forced the unelected Hong Kong government and thousands of heavily armed riot police to beat a retreat. Global media, grasping the unprecedented nature of these events, call this a “historic standoff”. With the mass protests continuing to grow and feeling enormous self-confidence since defeating Sunday’s massive police attack, the movement in Hong Kong represents, in the words of Associated Press, a “major pushback” against the Beijing regime’s anti-democratic agenda in Hong Kong, and in China. The vicious police onslaught of Sunday 28 September produced shock and anger throughout society on a scale not seen before. This is the most serious political crisis in Hong Kong since its reversion to Chinese rule in 1997. There are some features of a pre-revolutionary situation, with a government in deep crisis having suffered a loss of control and authority. The state institutions – especially the police – are now widely distrusted and despised. The territory’s tenuous ‘autonomy’ as a special region of China is now distrusted or rejected as a fake by a majority of Hong Kong people. Yet this movement is almost entirely without organisations, programme or leadership, replicating a pattern we have seen in similar mass protest movements around the world. There is a powerful anti-party mood within the demonstrations, and while Hong Kong’s opposition bourgeois democratic parties continue to issue statements identifying themselves with the movement, monopolising most media interviews, these parties are almost completely absent on the ground inside the protests. While this ‘spontaneous’ model has proven itself more than equal to the task of kick-starting the movement on the streets, more will be needed: steps to organise, build democratic strike committees and occupation committees, and work out a clear programme of demands to take the struggle forward to defeat the government’s anti-democratic agenda. A crucial issue is the need to spread the movement across the border, by issuing appeals to workers and youth in mainland China to join the struggle against China’s one-party (CCP) dictatorship. Clearly, as long as the CCP rules there will be no possibility of democratic elections in Hong Kong – the main focus of this movement – and only the toppling of this regime will open that road. This task requires greater forces than the masses of Hong Kong alone can muster. Rather than appealing to the US administration or ex-colonial masters Britain for support, as some pan democratic organisations are doing (for US and British capitalism, financial deals with China always trump concerns over democracy and human rights), the protest movement must seek allies among grassroots workers and youth in China and worldwide. The movement has widely been dubbed the “Umbrella Revolution” on social media, due to the inverted umbrellas used by protesters as protection against tear gas and especially pepper spray. 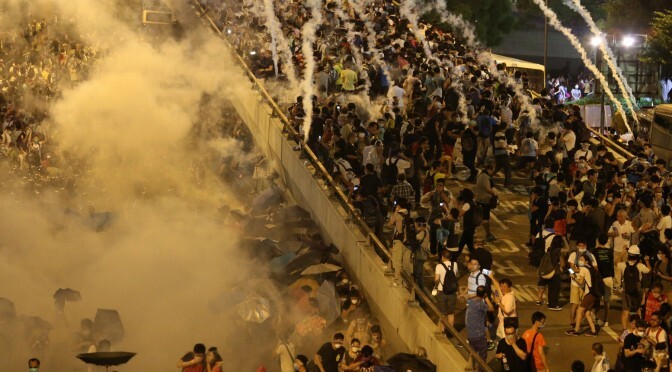 On Sunday, September 28, the police launched wave after wave of tear gas attacks – 87 times according to their own statement – in an attempt to clear the protests around the government headquarters in Admiralty. Not since 1967, then under British colonial rule, has tear gas been used against Hong Kong demonstrators (it was used by police in 2005 at the anti-WTO protests, but these were largely ‘international’ in composition). 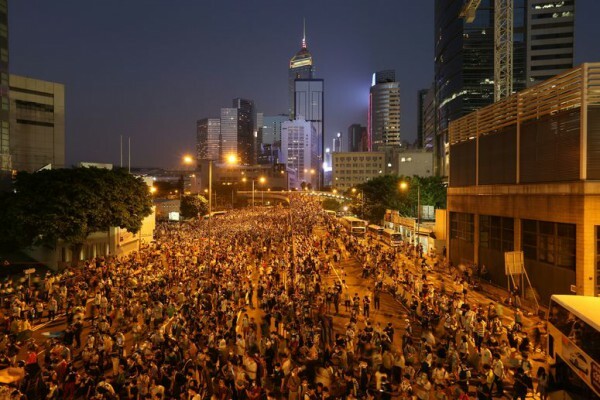 By Monday evening, September 29, massive crowds totalling around 180,000 had gathered in three locations around Hong Kong. 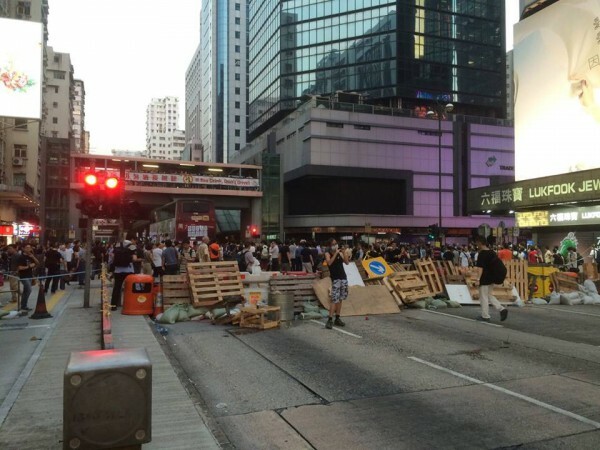 Some sporadic barricades have been thrown across major roads, and on Sunday night a ‘general strike’ call was issued by the Hong Kong Confederation of Trade Unions (HKCTU). 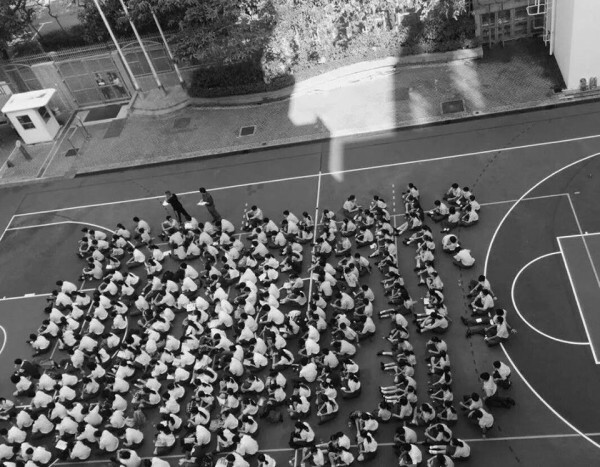 While the latter is an extremely significant development – again it is unprecedented in Hong Kong for a political strike to be announced, something the supporters of the CWI, Socialist Action, have previously been alone in urging – the participation of workers in the strike is at this stage quite limited. University students, increasingly joined by school students who have faced huge pressure and threats from school authorities, have extended last week’s strike action, with walkouts and sit-in protests on a larger scale than before. 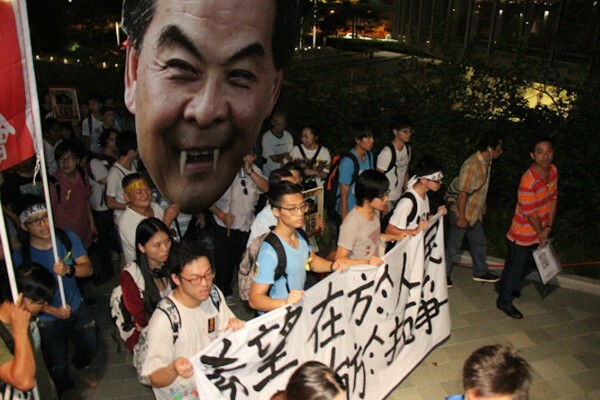 Such is the speed of events that the main focus of the demonstrations is now to demand the resignation of Chief Executive CY Leung, an already hated figure whose role as mastermind of the weekend’s crackdown only adds to his list of crimes. This is not only a crisis for Hong Kong’s ruling elite. Through crass brutality, in its attempt to show a ‘firm hand’ against democracy protests, the government – under pressure from and eager to demonstrate its loyalty to Beijing – has triggered what is potentially the biggest challenge to the one-party (CCP) dictatorship in a quarter century. “This is already much bigger than anything the Beijing or Hong Kong authorities expected,” commented Larry Diamond of Stanford University in the New York Times. “They have no strategy for peacefully defusing it, because that would require negotiations, and I don’t think President Xi Jinping will allow that,” he added. 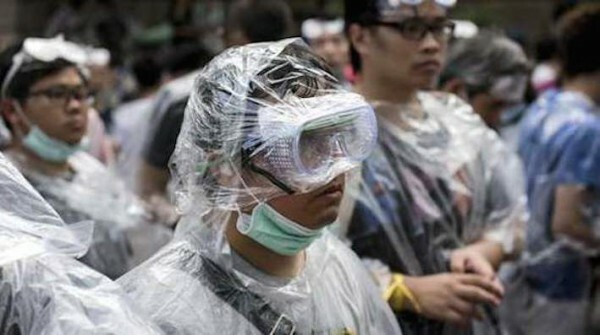 Not surprisingly, China has tightened internet controls, blocking online searches for words such as “tear gas” and “occupy” and banning Instagram, which had been used to spread images of the Hong Kong protests in China. It is extremely significant that this movement, like many others worldwide, began with the youth, and specifically with the school strike that commenced on 22 September. 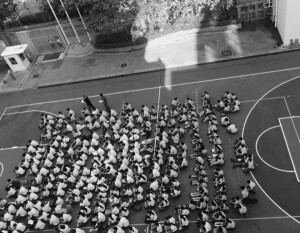 For much of the past two years, supporters and student members of Socialist Action have been alone in advocating a citywide school strike, with the idea that this could trigger strikes among workers, as a key weapon in the democracy struggle. This perspective has been confirmed almost to the last detail in the events of the past week. The current huge protests and street occupations evolved out of the weeklong school strike, in which around 13,000 university students participated. These were joined by around 1,500 secondary school students, some as young as 12 and 13, on Friday, September 26. On Friday evening, a group of student protesters managed to break the cordon around the ‘Civic Square’ and began an occupation there. This is a nominally public protest zone at the government headquarters that has been fenced off by police since July, in anticipation of ‘occupy’ protests. Around 80 students and other demonstrators were arrested on Friday and Saturday, with police using pepper spray and heavy-handed tactics. The 17-year-old convenor of student group Scholarism, Joshua Wong, was arrested and held for 40 hours, then released without charge. Initially however, the police announced Wong would face three charges including the serious charge of “assaulting police”. The arrests of student activists and excessive police violence provided the spark for the weekend’s mass mobilisations. At its highest point, 120,000 turned out on Sunday afternoon to protest the police repression against the students. Even after the first gas attacks on Sunday evening, around 50,000 remained and faced off against rows of riot police. Reports came, subsequently denied, that the police were preparing to use rubber bullets and bring in armoured cars equipped with ear-piercing ‘sound cannons’. In such a chaotic situation it is hard to know whether these were false rumours, perhaps deliberately circulated, or whether the reports were genuine but then the government and police leadership hesitated and drew back. The reports were taken seriously by leaders of the Occupy Central (OC) movement, however, who it should be stressed played no part in the student strike or the weekend’s mobilisations. It would be more accurate to say they ‘parachuted’ themselves into the demonstrations in order to claim a leading role once the scale of the movement was beyond all doubt. On Sunday night, as rumours of bullets and armoured vehicles circulated, OC leader Chan Kin-man called on protesters in Admiralty to retreat. “It is a matter of life and death,” he said. Even leaders of the Federation of Students called on protesters to leave the area, something that was openly criticised by ‘Longhair’ Leung Kwok-hung of the League of Social Democrats, who urged the protesters to stand their ground. While most protesters did evacuate the main protest site in Admiralty, new occupations sprang up in two other parts of the city, with around 3,000 assembling in Mong Kok, closing down Nathan Road, the main traffic artery through Kowloon. “Occupy Mong Kok” is still going strong at the time of writing, with around 30,000 gathering there on Monday night. Others camped overnight in Causeway Bay, another busy business and shopping district. So, the police attacks did not succeed as planned in dispersing and quelling the ‘Occupy’ movement. Instead the protests have ‘mestatised’ – in response to police tactics – into multiple occupations, which present a far bigger challenge for the police to crack down on. This outcome represents a big victory for the protests in withstanding and overcoming what Willy Lam, a liberal commentator, described as “a massive show of force” by the police. The Hong Kong police have been preparing – with meticulous detail – for two years since OC was first announced, to break up the occupation. Their task has been made easier by the repeated delays and prevarications of OC’s leaders. This has involved wholesale conversion of the police into a paramilitary force, staging numerous drills to harden the police ‘cadre’ as a political tool against the democracy struggle. Yet despite this, and the lack at this stage of cohesive organisation within the demonstrations, the police onslaught failed in the face of stubborn and heroic resistance. Significantly, one of the main slogans chanted towards the police by protesters since the attacks of Sunday night has been “Police, strike!” This is an appeal for police to refuse orders and undoubtedly poses new problems for police commanders as morale is dented and they are forced to completely rethink their strategies. The destruction of decades-old illusions in the impartiality of the state and Hong Kong’s sacred ‘rule of law’ is a result of the CCP’s increasingly hardline, repressive and rigid position, which is in turn a reflection of the deepening crisis within the dictatorship. The CCP resembles a machine with only one gear: repression. With the regime set on removing rather than installing ‘shock absorbers’ in the form of the limited political reforms favoured by bourgeois liberals, the political perspectives for China are increasingly towards a social explosion or series of explosions. Towards revolutionary upheavals in other words, a foretaste of which we are now witnessing in Hong Kong. This is shown very graphically by the worsening state crackdown in the western Muslim-majority region of Xinjiang, with hundreds killed this year in clashes with state forces and a recent decision to ban beards from buses in some parts of the region! Last week a kangaroo court imposed a de facto life sentence on Muslim Uighur professor Ilham Tothi on a charge of ‘separatism’. Yet Tothi is widely seen as a moderate critic of the Chinese regime, advocating reform rather than revolution. Likewise, in Hong Kong the regime has kicked away the ladder holding up the ‘moderate’ bourgeois pan democratic leaders, who wanted little more than an invite to talks over electoral changes. The ‘moderates’ were prepared to swallow most of Beijing’s undemocratic rules and controls in return for quite minor concessions, but it refused. This hardline approach is rapidly eroding the remaining tolerance towards the regime, in Hong Kong for example, where many bought into the idea that the city could coexist as a relatively democratic enclave within an authoritarian China. The supporters of the CWI in Hong Kong and China have long explained that this was not possible; that either the democracy struggle would spread across China – with the initial spark quite possibly coming from Hong Kong’s protest movements – resulting in the downfall of the dictatorship, or the dictatorship would increasingly seek to close down Hong Kong’s democratic space. This is the dynamic we are witnessing today. A recent poll in the South China Morning Post published before the current mass movement, showed that 53 percent of people in Hong Kong now have no confidence in the “one country, two systems” formula (allowing Hong Kong a degree of autonomy) compared with 37 percent who have the opposite opinion. This has slumped from 76 percent who had faith in the “one country, two systems” arrangement in 2007. As we have explained in previous reports, Hong Kong ‘separatist’ moods and support for independence from China will inevitably increase as a result of the dictatorship’s present policies. But Beijing, especially under Xi Jinping, fears the loss of control – in China and not just Hong Kong – should it allow even one window or door to open towards ‘free elections’ on the so-called Western model. It wants not only to put the city’s democratic process on hold, but to reverse it, imposing greater political control over the city. The August NPC ruling is just one element in a plan that aims to cage the Hong Kong democracy struggle. In addition to militarising the police and tightening controls on the local media, this plan includes reducing the powers of the largely toothless Hong Kong legislature and transferring greater control, over the budget for example, to the next Chief Executive ‘elected by the people’ under the mock electoral system outlined in the NPC ruling. It is this grand project to bring Hong Kong more closely under authoritarian rule that has run into the wall of mass opposition in the past few days. The government’s plan to crush and discredit ‘OC’, and in this way ride out the storm of protests over Beijing’s undemocratic election proposals, is now in tatters. Despite massive propaganda against the occupation, and lurid warnings of “chaos” and “violence”, it’s evident which side has won the battle for public support through the events of this weekend. The South China Morning Post reported that office workers on their way to work on Monday morning cheered the occupiers in Causeway Bay. The newspaper quoted an accountant who said the government had “underestimated the power of the people.” There are many reports of passers by bringing water and food and showing support. 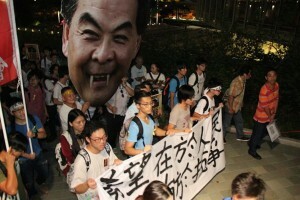 The huge turnout on Monday evening and the mass chants of “Down with CY Leung” show where the movement is now at. The first stirrings of the working class, which has up to now not made an entrance as a distinct, organised and independent force within the democracy movement, is for socialists the most significant of all developments. While the response to the strike call has been mixed, reflecting the numerical weakness of the unions in Hong Kong over a long historical period, still some important groups stopped work in anger at the police crackdown. These included around 200 workers at the Coca Cola factory in Sha Tin, water workers, bus drivers, some bank employees and schoolteachers. In this struggle, the two-year-old ‘Occupy Central’ movement is little more than a footnote, a plan that was never put into practise and has since been swept aside by the ‘umbrella revolution’ improvised from below. As we have pointed out in our criticisms of OC leaders, their vision was always for a much smaller and largely symbolic protest, of just 10,000 participants, initially even stating that young people should not take part in the occupation. Every aspect of their plan resonated with a fear of ‘radical action’ and spontaneity. Reality has turned all this on its head. So, while sections of the capitalist media – and we can understand why they do this – continue to present the OC leaders as initiators of the current mass movement, this is not the case at all. The current movement developed independently of the OC leaders who stood on the sidelines, playing no part either in the student strikes or the first wave of protests against police violence. This did not change until early on Sunday morning, September 28, when the mass movement was already speeding ahead and the OC leaders found themselves ‘running after the bus’. As Socialist Action explained at OC’s inception in 2013, while supporting the call for a mass occupation, OC was also an attempt by the ‘moderate’ pan democratic leaders to rebuild their damaged authority within the democracy struggle, especially among the youth and many activists, and position themselves at the head of the coming showdown over electoral reform. While the idea of occupation corresponded with the popular mood for more radical struggle to achieve democracy, the aim of the ‘moderate’ pan democrats was to use the ‘OC’ brand to block more radical initiatives from below. The ‘moderates’ who are close politically to the OC leadership, and who until last month were still looking for a compromise with Beijing, have suffered big electoral losses in favour of more radical pro-democracy candidates in recent years as a result of their betrayals and rotten compromises with the dictatorship, particularly during the previous round of electoral reforms in 2010. On almost every issue – timing, composition, strategy, not to mention their very limited and ‘moderate’ programme – the OC leaders have been out of sync with reality and the mood of the masses. Even their choice of location, Central, has been bypassed by the actual development of the struggle. This movement is rather ‘Occupy Decentral’ – consciously adopting a devolved character across several areas to outmanoeuvre the police. The current movement emerged from below, from the demonstrators who have borne the brunt of police attacks, rather than from self-appointed ‘leaders’. Socialist Action has stressed that what’s needed but still sadly lacking is a democratically elected leadership for the mass protests, an action committee to decide strategy and tactics, open to all groupings, parties and unions, but with no one group trying to impose a monopoly. The weekend’s events have conjured up in the minds of many people parallels to the 1989 democracy struggle in China and the brutal crackdown that followed it. In previous articles we have looked at the question of how far the Chinese regime would be prepared to go to block demands for free elections in Hong Kong. There is an extremely sharp and potentially explosive power struggle taking place within the CCP dictatorship. Xi Jinping can ill afford to appear weak or mishandle a political crisis in Hong Kong. This could trigger a counterstrike upon Xi’s position from the ‘vested interests’ and ‘tigers’ (top officials) who have been targeted by purges in the past two years. In its ruling in August, the CCP threw down the gauntlet, brushing aside even the minimal demands of the ‘moderate’ pan democrats and calculating it could contain or crush the challenge that seemed at that time to be coming from a timid OC leadership. Yet as we have seen, and as socialists warned was an increasing possibility, due in no small part to Beijing’s intransigence the current movement has erupted without and despite the ‘moderate’ leaders. The initial attempt at mass repression has – much like several of the gas canisters thrown by the police – blown back in the face of the government. This has forced CY Leung and the local state forces onto the back foot for the time being. On Monday, as reported by the Financial Times, the government announced the removal of the riot police from the streets (although this was only partly true). Early on Monday morning the ‘good cops’ of the police public relations department were sent out to negotiate with protesters, asking ‘nicely’ if the roads could be left open for traffic, as if nothing had happened the night before! In the occupations in Mong Kok and Causeway Bay there is currently almost no police presence, while at the government compound in Admiralty protesters still face heavy police lines. Even the mega firework display in Hong Kong harbour to celebrate the 65th anniversary of the founding of the People’s Republic of China, on October 1, has been cancelled due to fears of protests. This is just a foretaste of how the current political crisis in Hong Kong can rebound upon Xi Jinping and puncture the triumphant image he wishes to promote. 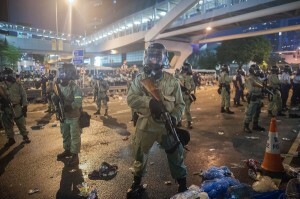 China’s Global Times, a rabid government mouthpiece, carried an English-language editorial saying, “the radical activists are doomed.” On the paper’s Chinese language website, an article was deleted that said the People’s Armed Police, China’s anti-riot and anti-terror force, could assist Hong Kong police to put down the protests. “Support from the armed forces could quickly restore stability” in Hong Kong, it said. That such talk is being toned down for the time being indicates that even in Beijing – where there are signs of ‘disconnect’ and a poor grasp of realities on the ground, not only but especially in Hong Kong – there is now a recognition that an explosive political crisis has been created and a need to tread carefully. Even the 5,000 PLA troops stationed in Hong Kong would not necessarily be sufficient to ‘restore order’ i.e. strike a decisive blow against the protests, especially with the increasingly decentralised character of the movement. Deploying Chinese troops would risk igniting an even bigger political backlash. For the Chinese regime and the Hong Kong capitalist establishment the PLA garrison in more useful as a deterrent, a threat rather than a serious intention. That is not to say that PLA troops would never be used, including the drafting of reinforcements from over the border, in the event of a crisis and splits within the local Hong Kong state apparatus and police force. In the short-term however this is unlikely. The government’s tactic in coming days, as in Taiwan during the ‘sunflower movement’ earlier this year, will be to use paid gangsters and pro-CCP ‘volunteer groups’ to act as provocateurs who trigger clashes that can be used to discredit the movement and provide a pretext for a new police crackdown. Although the situation is extremely fast-moving, with sharp variations and changes possible, it seems now that the regime will hold back from unleashing a new repressive wave, and probably offer concessions, perhaps sacrifice an unpopular official (as it done on occasions before) in order to buy time and allow the crisis to pass. It cannot be ruled out that CY will be forced to bow out in the interests of restoring ‘stability’ in Hong Kong, although his departure in the face of a mass protest movement will carry an enormous cost for both the Hong Kong and Chinese regimes. It will greatly raise the confidence of the democracy movement and vindicate the idea of audacious mass resistance. The call for CY’s ouster is now the central focus and demand of the mass movement. Even the OC leaders have called for the Chief Executive’s resignation, reflecting the pressure of mass anger they are feeling at this moment. On Monday night, CY issued a statement that he will “not compromise” – but as the crisis drags on open splits will emerge in the government camp, with the pressure mounting upon him. Socialist Action has been active throughout this movement and is playing an important role in organising strikes among secondary school students through the Citywide School Strike Campaign (see link below). Socialist Action explains that genuine democracy can only be achieved by linking mass protests in Hong Kong with the coming revolutionary upheavals in China, where the gigantic working class is the most important force to change society and defeat the dictatorship. The struggle for real democracy cannot be won within the confines of capitalism, which everywhere including the ‘Western democracies’ favoured by pan democratic leaders, means the control of politics by unelected billionaires and big corporations. Capitalism means dictatorship, either by authoritarian regimes or by financial markets. Our alternative is a socialist society and democratically-run and planned economy that can eliminate rising poverty levels, housing misery, unemployment and low-paid contract labour. Within the current mass protests Socialist Action stands for the creation of a mass workers’ party in Hong Kong and also in China, that links revolutionary democratic demands with the need for a clear socialist alternative. 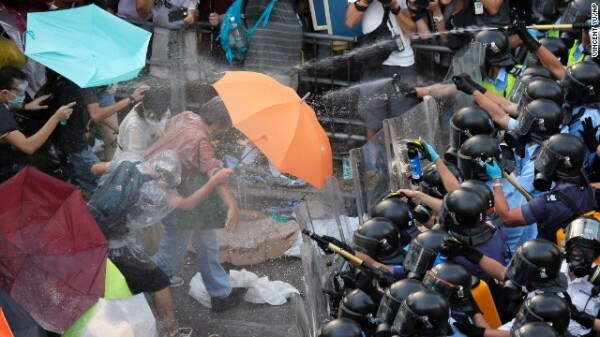 Solidarity with Hong Kong’s ‘umbrella revolution’ of mass civil disobedience, strikes and occupations! Spread the strike movement! 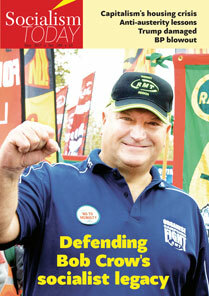 Build unions and democratic strike committees of workers and students. For immediate and full democracy in Hong Kong and China! Down with one-party CCP dictatorship! Kick out CY Leung and his unelected government! Oppose repression – no new Tiananmen crackdowns! Tibetans in revolt – what is the way forward?